The Leukaemia Busters mission, assisted by Ocean Harmony and other generous contributors, is to fund and conduct research focused on discovering and developing novel antibody-based treatment for patients with Leukaemia and other related cancers. Their vision is a world in which Leukaemia is quickly and completely cured in every patient. With generous support from the public, they can fulfil this mission, so come along to Showtime, have a great evening and help us raise the urgently needed funds. 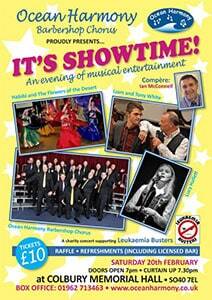 It all promises to be a wonderful and exciting evening and so we strongly recommend that you book your ticket early to secure your place at Showtime.